The clinical features of acute abdominal pain are often nonspecific, and surgery may be required to elucidate the correct diagnosis. Imaging modalities such as computed tomography (CT) scanning have proved invaluable in making diagnoses with relative accuracy and preventing unnecessary operative procedures. We describe the case of a 57-year-old man who presented with abdominal pain of subacute onset but worsening over the previous week. He had poor appetite, fever, rigors and constipation. He was pyrexial and had a tachycardia, localised tenderness over the left iliac fossa and a mild leucocytosis. 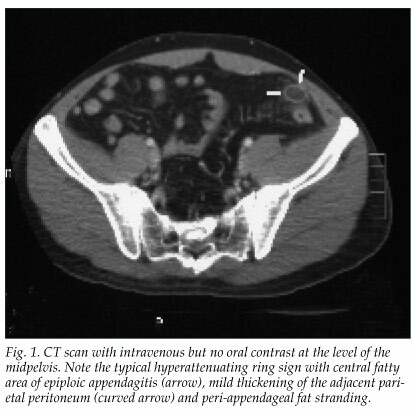 A well-defined 1x1.5 cm oval ring of soft-tissue attenuation surrounding a central area of fatty attenuation was noted on CT scan (Fig. 1). Its posterior aspect was closely related to the adjacent distal sigmoid colon and it appeared anteriorly adherent to the parietal peritoneum. 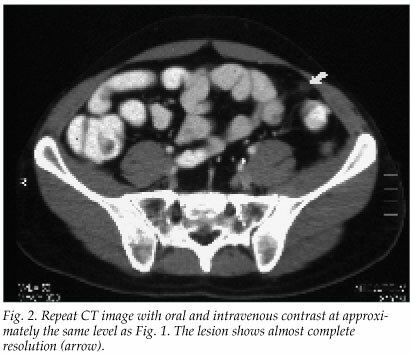 A diagnosis of primary epiploic appendagitis (EA) was made on the CT findings. The patient was discharged with analgesia. A repeat CT scan was done 2 weeks later (Fig. 2). The central area enclosed by the hyperattenuating ring is always of fatty density.5,6 Follow-up CT scan after treatment characteristically demonstrates complete resolution in EA. Based on the imaging features, the differential diagnosis includes segmental omental infarction, secondary EA and peritoneal metastasis. Segmental omental infarction and primary EA have similar clinical features and the same treatment.1,7 The 'hyperattenuating ring sign' is seen in both primary and secondary EA. Secondary EA is caused by contiguous inflammatory changes of the appendices epiploicae as a result of pathology within an adjacent organ. Depending of the location of the EA, associated diverticulitis, appendicitis or cholecystitis must be excluded. The treatment of secondary EA should be directed at the underlying cause. Peritoneal metastasis is another possible imaging mimic, usually with involvement of multiple rather than single epiploica.